Near-field Imaging, Antenna Radiation Pattern Measurement, Microwave Material Characterization, Benchtop Testing. This lab is part of ECERF (Electrical and Computer Engineering Research Facility). 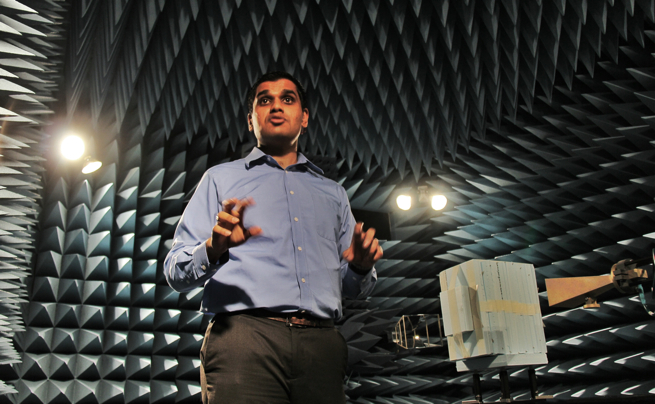 All wireless communication – from smartphones to radar to GPS – relies fundamentally on the ability to measure the electromagnetic (EM) fields produced by antennas. The desire to control these EM fields has also spawned a new area of research in metamaterials: new materials exhibiting EM properties never before seen in nature, such as the ability to render objects invisible. The University of Alberta is at the forefront of these exciting new fields thanks to our one-of-a-kind, fully equipped near-field antenna- and metamaterial-characterization facility. This system is built around a state-of-the-art near-field robotic scanner, shielded anechoic chamber, and 43.5GHz vector network analyzer. 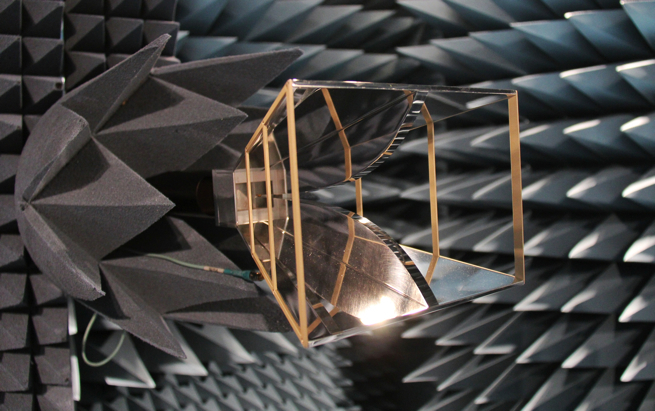 Together, these components enable precise, automated antenna radiation-pattern measurements from RF/microwave to millimeter-wave frequencies, but they also provide customized capabilities for the observation of novel metamaterial imaging, radiation, and scattering phenomena. Our facility is one of Canada’s most capable and flexible antenna measurement systems and leads antenna and near-field measurement capabilities in Alberta. 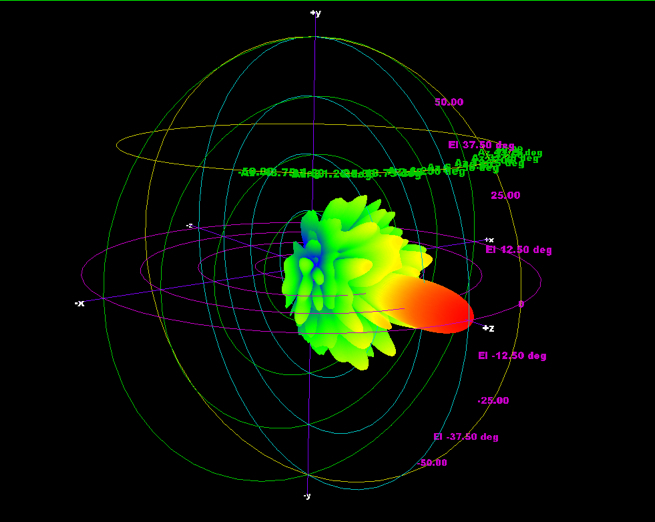 3D Radiation pattern measured by the near-field system. 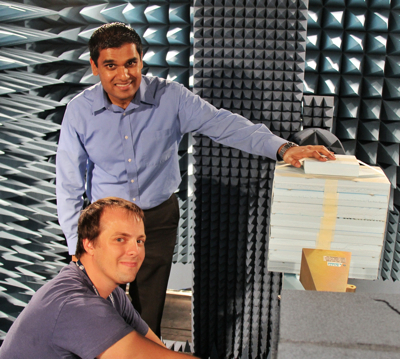 Dr. Iyer and his graduate student J. Pollock conducting measurements in the anechoic chamber. Dr. Iyer explaining the operation of the near-field measurement system. Horn Antenna mounted on the mobile positioner. 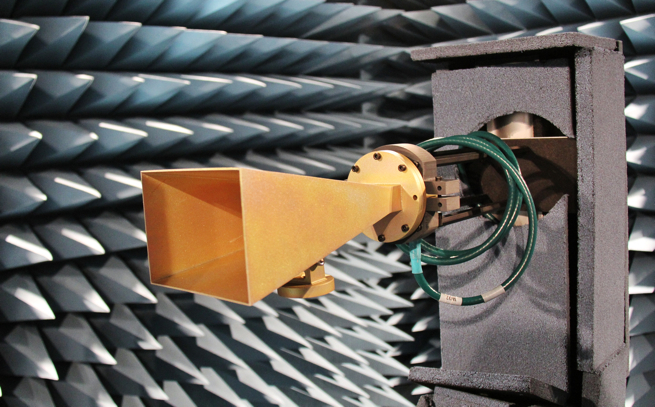 Broadband ridged-horn probe antenna mounted on the mobile positioner.